’n Heerlike aartappelgereg bly altyd ’n wenner by ’n ete. Dis werklik kos van die aarde. Hierdie aartappelgebak is nie so ryk soos wat mense dit gewoonlik maak nie. Ek gebruik melk pleks van room. Die gereg is baie vullend en is gerieflik om as ’n bykos of selfs ’n ligte maaltyd te bedien. Dit is ook gewild as ’n bykos vir braaivleis. 1 .Skil die aartappels en kook tot sag, maar steeds ferm. Sny in skywe en pak die helfte in die bodem van ’n groot, oondvaste bak. 2.Verhit die olie en braai die spek tot gaar en laat eenkant. 3 .Meng soppoeier met melk in ’n swaarboomkastrol. Bring tot kookpunt en roer aanhoudend vir ’n paar minute totdat dit begin verdik. Voeg die peper en origanum by. 4. Giet die helfte van die sous oor die aartappels. Pak die oorblywende aartappels oor die sous. Skep die spek bo-op en giet die orige sous oor. Sprinkel die kaas bo-oor. Bak vir 20-30 minute in ’n voorverhitte oond teen 180?°C of tot goudbruin. Vegetariërs kan die spekvleis deur vars knopiesampioene of murgpampoentjies vervang. Uie wat effens gebraai is, kan ook bygevoeg word. Die kruie kan ook vervang word deur enige ander kruie van jou keuse. 5 Bak vir sowat ’n 1-1½ uur tot goudbruin en gaar. Druk ’n toetspen in om seker te maak dat dit deurgaar is. Kook aartappels en ui saam tot gaar en maak dan fyn. Meng nou al hierdie goed saam tot glad en romerig. Indien kapokaartappels ‘n bietjie te styf is voeg dan ‘n bietjie melk by en meng deur. Ek sit soms ook bietjie gerasperde cheddarkaas by of ‘n desertlepel gladde rissie maaskaas. Skil aartappels en sny in skywe. Pak skywe aartappels in oondbak en gooi sout oor. Smelt botter en knoffel in mikrogolfoond. Gooi room by en gooi melk-roomvulsel oor aartappels. Bak vir 1 – 1½ uur by 180 grade. Voor opdiening gooi gerasperde kaas by en roer deeglik. Do you love French fries but hate all the fat and calories that come with them? 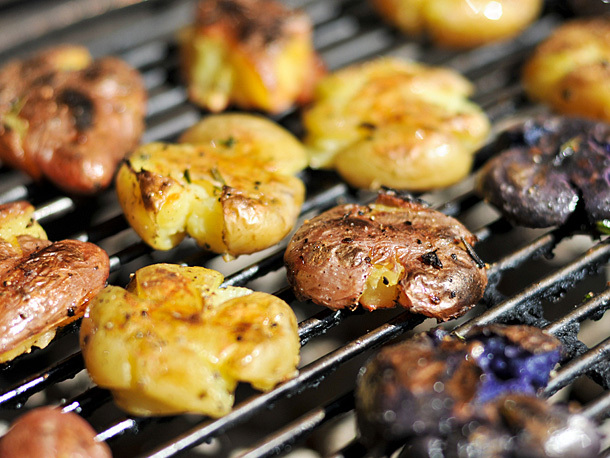 Try grilling your potatoes instead with this Grilled Potatoes recipe. It's a great vegetarian recipe and you'll cut out a ton of guilt. Serve them with some homemade ketchup and enjoy!! Preheat grill to medium-high heat (an indoor grill would work too). Cut potatoes into 1/4-inch thick slices. I used a fancy crinkle knife with ridges but straight cuts are fine. Toss the potatoes with olive oil. Add salt, and pepper to your taste. Reduce heat on the grill to medium and lay the potatoes slices straight onto the grill; close the lid. Cook until the potatoes are golden on one side, about 6 to 10 minutes, making sure they don't burn and adjusting flame accordingly. Turn and cook until tender inside when pierced with a fork, but slightly crisp and golden brown on the outside. Remove from grill, and serve immediately. "These easy cheese potatoes are great over the grill or campfire. And since they're in a foil packet, there's no mess to clean up!" 1.Build a campfire and allow the fire to burn until it has accumulated a bed of coals. Rake the coals into a flat bed on one side of the fire. 2.Cut 2 lengths of heavy duty foil approximately 18 inches square, placing one on top of the other for strength. Spray top one with non-stick spray. Spread potatoes on foil leaving plenty of room to fold up later. Scatter the onion over potatoes; slice the margarine over the potatoes; layer the Parmesan, mozzarella, and Cheddar cheeses over the potatoes; season with salt and pepper. Bring opposite edges of foil together and seal. 3.Place the packet directly onto your campfire and cook until the potatoes are soft, about 35 minutes. Place potato slices in a microwave-safe bowl and microwave on high for 6 minutes. This will save significant time baking, as it will start to cook the potatoes. Over medium-high heat, cook bacon for 3 minutes, or until it begins to sweat. Add onion and mushrooms and cook until tender. Season with additional kosher salt and/or black pepper to taste. Add garlic and cook for one additional minute. Remove from heat. In a medium sauce pan, melt butter over medium heat. Mix in flour and 1/2 tsp. salt, stirring constantly with a whisk. Cook for one minutes. Add the milk and stir to combine. Continue to cook, stirring very frequently, until mixture has thickened. Stir in cheddar cheese all at once and stir until melted. Continue to stir for one minute after cheese is melted. Taste for seasoning and add more kosher salt if needed. In a large mixing bowl, combine potatoes, onion-mushroom-bacon mixture and cheese sauce. Gently toss to combine, making sure to coat the potatoes as evenly as possible. Bake, covered with aluminum foil, for 40-50 minutes, until potatoes are completely tender. Remove aluminum foil and bake, uncovered, for an additional 10-15 minutes until top is golden brown. Maak soos jy potbrood sou maak in platboompan met kooltjies op die deksel. Maak dit in jou Buksie-oondjie. Meng die aartappels met die lewer/spek of sardientjies. Voeg die gekapte ui en suurlemoensap by. Heerlik as ‘n smeer vir toebroodjies of vir ‘n voorgereg saam met geroosterde driehoekbroodjies/soutbeskuitjies. Meng aartappels met melk en meel. Druk plat met jou handpalm om ‘n ronde sirkel te vorm. Vul elke sirkel met ‘n eetlepel maalvleis. Vlakbraai hierdie koekies nou in olie tot goudbruin aan beidekante. Heerlik as ‘n ligte egte met slaaitjie. Kan ook vir ontbyt bedien word met ‘n gebakte eier. Skil aartappels en kook. Hou eenkant. Braai ui,garlic,bacon en greenpepper. Meng sampioensop met melk. Sny sampioene in skywe en voeg by uie en voeg swart peper. Gooi melkmengsel en houer room by pan en prut vir 5min op lae hitte. Spuit vuurvaste oondbak met spray en cook en sit aartappels in. Gooi die pan mengsel bo-oor aartappels en sit kaas bo-oor. Bak by 180c in oond vir 30 min. Hierdie warm slaai is genoeg vir 6 mense. Maak in jou BUKSIE, of in platswartboompan met kooltjies op die deksel. 1.Bring 1 inch of water to a boil in a large pot. Place potatoes in a steamer basket and steam for 10 minutes. Place broccoli on top, cover and steam until the potatoes and broccoli are tender, 6 to 8 minutes more. Transfer the broccoli to a large bowl and coarsely mash with a potato masher. Add the potatoes, cheese, milk, salt and pepper and continue mashing to desired consistency. Serve immediately. 1.Place red potatoes, yellow potatoes, jalapeno pepper, carrots and garlic cloves in a large pot. Cover with water, and bring to a boil over high heat. Cook 15 to 20 minutes, or until potatoes are tender. Drain water from pot. 2.Stir in corn and butter. Mash the mixture with a potato masher until butter is melted and potatoes have reached desired consistency. Mix in cheese, salt, and pepper. Serve hot. Step 1: Count your friends and allocate one potato or sweet potato to each. Step 2: Wash the spuds. Step 3: Cut slices into the spuds, widthways, stopping about 1 cm from the bottom. Step 4: Decide what you are going to stuff in between the slices. Step 5: Once stuffed, wrap the spuds into foil (shiny side in). Step 6: Pop the spuds into the coals (probably the ones you’re busy braaiing your meat on) and turn them frequently to make sure they don’t burn. They should cook for about 45 minutes, but once they’re soft, it’s time to take them off the heat. Also, bear in mind that sweet potatoes cook faster than potatoes, so if you’re doing a combination of both, put the sweet potatoes into the fire about 15 minutes later. Slice the cheese and roughly chop up some fresh rosemary. Put a slice of Camembert and some rosemary in between each sweet potato slice. Drizzle olive oil over the potato to prevent the cheese from sticking to the foil. Roughly chop up a small handful of sage and using a fork, mush it with a couple of knobs of butter. Once the butter is creamy and soft, scoop lashings of it in between the potato slices. Really good with sweet potato too. Fry off a couple of streaks of chopped bacon, a medium onion (sliced) and two chopped chillies. Mix it all together and stuff it into sliced potato. Top with grated cheddar cheese, a drizzle of olive oil and more chillies if you like it hot. PROBEER GERUS...HEERLIK SAAM MET 'N BRAAI! A coconut milk based curry with chillies and dhania. This really does satisfy a hearty appetite. Peanuts increase the protein content, making it an excellent vegetarian dish. 1.Gently fry the onion slices in heated oil. 2.Stir in the curry powder and chilli and cook lightly. Pour on the coconut milk and sugar and bring to the boil. 3.Add in the potatoes, cover and simmer for 20 minutes, stirring occasionally. 4.Stir in the lemon juice, spring onions and dhania, and set aside off the heat with the pot lid on for 5 minutes for the flavours to infuse. 5.Sprinkle the peanuts on top, and serve with freshly cooked fluffy white rice. Use soft-cooking BP1 or Mondeor potato cultivars in place of new potatoes, but rather peel them. 1.Pre-heat oven to 350 degrees. Coat a casserole dish with cooking spray. 2.In a large skillet, melt Country Crock over a medium heat. Add onions, garlic and bacon. Cook and stir for 6 minutes. Stir in thyme; cook for 2 more minutes. Pour in chicken broth and water; bring to a simmer. Stir in gnocchi. Cover and cook until the gnocchi is slightly tender, about 5 minutes. Remove from heat. Add cream of mushroom soup, spinach and red pepper flakes. Stir and taste. Add Salt & Pepper, if needed. Fold in 1/2 cup of cheese. 3.Pour gnocchi into baking dish. Sprinkle with the remaining cheese. Bake for 10 minutes or until the cheese is melted. Serve immediately. Wash and pierce the potato all over with a fork. Cook in the microwave until the potato is soft all the way through – about 6-7 minutes total, flipping halfway through. Cut the potato in half, then cut each half into squares. Don’t cut all the way through, just down to the skin. Season with butter, parmesan cheese and Lowry’s seasoning salt, then place on a baking sheet under the broiler for 10-15 minutes, or until golden brown. Brush potatoes with oil, season with salt and pepper and grill until slightly charred. Whisk the vinegar and mustard in a bowl, then slowly whisk in the olive oil. Whisk in salt and pepper, to taste. Add the potatoes to the vinaigrette, then add the peppers, onions and the parsley, and toss to combine. Mashed potatoes combined with your favorite mix-ins, lightly breaded and fried, and served on a stick. The Idaho Mashed Potato Pop may just change your life forever. Put the potatoes in a large sauce pan and cover with cold water. Bring the pot to a boil, then turn down the heat and simmer until the potatoes are tender and easily pierced with a fork, about 15-20 minutes.Drain the potatoes and return them to the hot, empty pot. Add the butter, salt and pepper, and mash the potatoes with a potato masher until mostly smooth. Add desired mix-ins. Let sit until potato mixture is cool enough to handle.In a deep, heavy pot or a deep fryer, heat the oil for deep-frying to 350° F.Scooping out about 1 Tablespoon of the potato mixture at a time, roll the potato mixture into 2-inch balls.Set up a breading station with two shallow bowls and a plate: Beat the egg with 2 teaspoons of water in the first bowl, then put the panko breadcrumbs or dehydrated potato flakes in the second. Roll each ball first in the egg, then in the breadcrumbs or potato flakes; put the coated mashed potato balls on the plate. Repeat until all the mashed potato balls are coated.Drop several of the mashed potato balls at once into the hot oil. Fry until golden brown, about 30 seconds. Remove with a slotted spoon and place the mashed potato balls on a rack set over a baking sheet. Repeat until all the mashed potato balls are fried.Stick a lollipop stick or toothpick into each ball. Serve hot, with dipping sauce if desired (see below).Dipping sauce suggestions: for Greek Mashed Potato Pops, Greek yogurt mixed with lemon juice and dried dill; for Southwestern Mashed Potato Pops, ranch dressing; for Bacon Mashed Potato Pops, mayonnaise mixed with Dijon mustard.Time Saving Tip: *4 cups of dehydrated Idaho® potato flakes mixed with 2 cups boiling water can be substituted for the fresh mashed potatoes. Prepare according to package directions, then proceed with recipe as written. Prep time: 40 mins Cook time: 20 mins Total time: 1 hour Yield: approximately 3 dozen 2-inch pops. This is a traditional Swedish side-dish, but I think it would go swimmingly with a proudly South African braai. After all it’s essentially a potato bake only with the addition of anchovies. We were initially a bit skeptical about the fishy component, but I have to say it blends in beautifully, adding just the right hit of saltiness to the finished product. I suppose you could cut the potatoes into slices instead of matchsticks, but I think the matchstick shapes add a nice textural diversity. Enjoy! 2. Saute onions in 1 tbsp butter until glazed and see-through. 3. Arrange half the potatoes in a greased casserole dish and tear anchovies onto the potato layer, distributing evenly. Top with the sauteed onions and pour over 1/2 cup of evaporated milk. Dot with the remainder of the butter (2 tbsp). 4. Bake for 30 minutes. Top with another 1/4 cup of evaporated milk and bake a further 15 minutes until browned on top. Keep cut potatoes covered with water to prevent discolouring. Dry off before using. 1.Heat the olive oil and fry the onions, red pepper and garlic flakes until soft. 2.Add the mustard seeds, turmeric, cumin and Crushed Chilli and fry for another minute or two. 3.Add the potatoes and half the stock. 4.Cook until the potatoes start to soften adding stock if necessary. 5.Add the cauliflower florets and toss to coat. 6.Add remaining stock and cover and simmer until vegetables are tender. 7.Add fresh curry leaves and fresh Dhania before serving. If you have potato plants in your garden, you know they grow in abundance, and it's hard to eat them all while they're fresh. Once you've given away as many as you can to your friends, try preserving the ones that remain by freezing them. This article provides information on how to freeze potatoes and enjoy them roasted, mashed or made into a salad when you're ready to eat them. 1 Dig or buy potatoes. Plan to freeze potatoes at the peak of their growing season, which is differs among varieties of potatoes. Choose potatoes with firm flesh, few bruises, and no sprouts. 2 Wash the potatoes. Scrub off the dirt and debris with a stiff-bristled brush. 3 Peel the potatoes. Use a peeler to remove the potato skin, or if you're working with new potatoes, scrape it off. Rinse the potatoes to prepare them for blanching. •If the potatoes are large, chop them in half before blanching. •Don't cut the potatoes into small pieces; it's better to store them whole if possible. 4 Bring a large pot of water to boil over high heat. In the meantime, prepare a large bowl with ice water and set it aside. 5 Plunge the potatoes into the boiling water. Allow them to blanch for 3 to 5 minutes. This process cleanses the potatoes of organisms and preserves their flavor and color. 6 Remove the potatoes from heat and place them in the ice water. •Transfer the potatoes directly from the pot to the ice water bath using a slotted spoon or tongs. •Allow them to cool for about ten minutes. •Drain the potatoes when they are chilled, and pat them dry. 7 Place the potatoes in airtight storage bags. You may also use a freezer-safe container. •Make sure the potatoes aren't wet when you place them in the bags, or ice will form. •If you aren't using a vacuum sealer, close the zippered bag almost all the way. Insert a straw into the opening. Draw out the remaining air through the straw. Withdraw the straw as you finish sealing the bag. •Put enough potatoes in each bag to make a meal for your family. This way you'll be able to defrost exactly as many as you need at once. 8 Store the potatoes in the freezer. They will keep for up to a year. 1 Preheat the oven to 425 degrees F (218 degrees C). 2 Remove potatoes from the freezer. Large potatoes serve one person each, but you'll need 3 or 4 smaller potatoes per person. 3 Use a sharp knife to chop the potatoes into bite-sized chunks. Smaller chunks will get crispier, and large chunks will be creamy inside. 4 Place the potatoes in a bowl. Toss them with olive oil, salt and pepper. •Consider adding more seasonings like garlic powder, rosemary, thyme, or chili powder. •Other oils such as peanut oil, vegetable oil, or canola oil also work. 5 Place an aluminum foil sheet on the baking sheet. Brushing oil on the baking sheet is also another way to prevent potatoes from sticking to the baking sheet. 6 Spread the potatoes evenly on a baking sheet. Place the sheet in the oven. 7 Roast the potatoes for 20 minutes. Remove them from the oven and toss them with tongs or a spatula, then return them to the oven for 15 minutes. 8 Remove the potatoes from the oven when they are done. They should be brown and crispy, but not burned. 1 Remove potatoes from the freezer. Large potatoes serve one person each, but you'll need 3 or 4 smaller potatoes per person. 2 Use a sharp knife to chop the potatoes into rough chunks. If the potatoes are already small, you can skip this step. 3 Place the potatoes in a large pot. Cover the potatoes with water. Place a lid on the pot and set it on the stove. Turn the heat to medium high and allow the potatoes to boil. 4 Cook the potatoes until they are soft. Take off the lid and poke a fork into them to test for doneness. •If the potatoes are fork tender, they are ready for the next step. •If the potatoes are still firm, allow them to cook until they are tender. 5 Remove the potatoes from heat and drain them. Pour them into a colander, then place them back in the empty pot. 6 Add a stick of butter, 1/2 cup milk, and salt and pepper to taste. Use a potato masher to mash the mixture together until it is smooth. •If you have an electric mixer, this can be used in place of the potato masher. •Spice up your mashed potatoes by adding additional seasonings, sour cream, cheese, chives, or green onions. 7 Scoop the mashed potatoes into a serving bowl. Serve alongside a main course of fish or meat. 2 Use a sharp knife to chop the potatoes into bite-sized chunks. Make them as small or as large as you want them, depending on your preferences for potato salad. 3 Place the potato pieces in a colander inside a bowl. Allow them to thaw. •The water from the frozen potatoes will drain into the bowl. •When the potatoes have thawed, discard the water. •Place the thawed potatoes in a mixing bowl and set aside. 6 Place the potato salad in a serving bowl. Serve at a picnic, or alongside barbecue or another summer dish. Kook water in ’n kastrol. Plaas aartappels in die kastrol, kook tot sag en dreineer die water. Kap intussen die bronkors grof (nie fyn soos pietersielie nie). Breek die aartappels grof met ’n vurk. Voeg olyfolie, korrelmosterd en bronkors by. Moenie skrik vir die hoeveelheid olie nie – terwyl die aartappels warm is, suig dit die olyfolie op. •Liquidise the garlic, coriander, chillies, vinegar, salt, sugar. •Boil the potatoes in jackets. Cool. •Peel potatoes & mash with above mixture. Do not blend in machine. Today's tin foil packet recipe is for a Potato Boat Dinner with ham, bacon & cheese. My son loves this dinner because it includes 2 of his favourite food groups...ham & bacon. This meal is so, so easy but it does require some planning and a bit of prep...it's a great idea to bake the potatoes before you leave home and wrap them in tin foil to take on the camping trip..and keep them chilled. Place on a hot BBQ for 20+ minutes...until potato is hot and cheese, ham & bacon have melted together and it looks toasty and good! The Potato Boat has so many possibilities...you could leave out the ham & bacon and just add cheese and broccoli, or chili,or cooked taco meat. I like to add fresh fruit because a) my kids love fruit and b) and it's a nice change from the saltiness of the bacon and ham. I have never seen a meal disappear so fast...or so much sour cream all over one person's face! Ahead of the cookout, boil them in advance, strain the water and let them cool. This way the starch will continue to break down into sugars during the cooling yet the firm texture will remain. It's best to strain them in a colander because the steam will drive off any excess moisture, something that again will make your potatoes go soggy and break up. So in terms of pulling this altogether in a method statement, here we go. Peel and slice your potatoes into wedges or slices just under 1cm or ½ inch thick. And pop them into salted boiling water for 10 minutes. After ten minutes, strain into a colander and allow to cool. Spray your grill plates or cooking grate with olive oil. When you're ready to cook, lay your potatoes on the grill and cook until golden brown which will usually take 5 – 10 minutes. Resist moving them around or turning them too much because this will cause them to break up, if possible just cook one side until brown and then flip them once onto the other side. Season with salt and pepper and tuck in. Or for an added twist, sprinkle a little smoked paprika over them. Boil the potatoes in a little salted water until they are cooked. Cool slightly. Roll each potato in a strip of bacon and secure with a sprig of rosemary. Place on a baking sheet and drizzle with some olive oil if you are baking them in the oven, otherwise place them on a grid and cook them on the open fire until the bacon is crispy. Serve with some pesto and a salad and you have a feast! If you have never thought to do roast potatoes on the braai or barbecue, give it a try. Prepare a direct fire, if you are doing steaks, chops or chicken pieces, or an indirect fire if you are cooking a roast on the barbecue. Par boil the potatoes in salted water for about 10 minutes and drain. Arrange the potatoes in a single layer in a cast iron pan or in an aluminium foil drip pan. Combine the remaining ingredients and pour over the potatoes; toss to coat all the potatoes well. Cook over the drip pan until you put your meat on, then move to the side of the fire while you cook your meat if you are using an indirect fire. If you are using a direct fire put the tray of potatoes on the side of the fire for about an hour; the potatoes will absorb all the liquid and will be puffed, crispy and golden brown. 1.Verhit water, aftreksel, pietersielie en uie in diep kastrol. 2.Voeg aartappels met skil by warm water. Laat kook ongeveer 20 minute of tot jy aartappels kan deursteek. Dreineer. 3.Sny 'n kruis op aartappels en plaas in gesmeerde oondbak van ongeveer 18 cm x 26 cm. 4.Braai spek tot gaar. Gooi bietjie water by as spek vloeistof nodig het.Laat afkoel. 5.Kap gaar spek fyner en sprinkel oor aartappels. 1.Meng soppoeier, pietersielie en kookwater tot goed gemeng. Roer mayonnaise en blatjang by. 2.Skep sous bo-oor aartappels en bak vir 30 minute. Op die potbrood bak metode sal dit ook werk. Hierdie resep is 'n heerlike bykos en dit het min bestanddele. 1 Kook aartappeltjies met skil in borrelende kookwater waarby 10 ml (2 t) sout gevoeg is. Kook ongeveer 14 minute of tot jy aartappeltjies met skerppuntmes kan deursteek. 2 Dreineer. Sny aartappeltjies in helfte. 3 Verhit bietjie olie en soteer ui en knoffel tot ui sag is. Voeg sampioene by en soteer vir ses minute tot sag. Sampioene hoef nie heeltemal gaar te wees nie. Voeg slaaisous by en roer deur. 4 Skep uiemengsel oor aartappeltjies en sprinkel fetakaas en swartpeper oor. 5 Hou warm tot dit voorgesit word. Let raw potatoes stand in cold water for at least half an hour before frying to improve the crispness of French-fried or roast potatoes. Preheat the oven to 200°C. Prick the potatoes using a fork, then rub with olive oil and season to taste. Bake for 1 hour, or until the skins are crisp and the flesh soft. Meanwhile, add the softened butter, mustard, chopped anchovies and watercress to a bowl and mix until combined. Season to taste. Serve the baked potatoes with spoonfuls of the flavoured butter. Place a layer of potatoes in the bottom of a foil loaf pan. Sprinkle with half the spring onions and top with half the sweetcorn and salt and freshly ground black pepper, to taste. Repeat layers, ending with a layer of potatoes. Drizzle with cream or milk. Sprinkle with the cheese. Cover the whole loaf tin with a double layer of aluminium foil and place in among the coals. Leave to cook for 20 to 30 minutes. A warm cheesy comfort food, perfect for winter days. In a medium pot, poach the haddock in the water and milk until it falls apart. Strain and reserve the cooking liquid (it should be 1l, but if not top up with more milk). Break the haddock up into pieces, removing any bones or skin and set aside. Rince the pot out, heat the butter and sauté the onion until soft, add the spinach, cover with a lid and simmer until wilted down. Quickly stir in the flour, coating the veg well. Slowly add the reserved liquid, stirring all the while, until no lumps are evident and it has thickened. When it starts boiling remove from the heat and add 250 ml cheese, peas and the haddock. Stir well. Slice the potatoes into 1 cm slices leaving the skin on. Spoon a 1/3 of the haddock mixture into a large baking dish, cover with a layer of potatoes and season a bit, repeat one more time ending off with the last 3rd of the haddock mixture. Mix 125 ml grated cheese and breadcrumbs together and sprinkle on top. A South African favourite that is filled with all things delicious. This potato bake does not need thinly sliced potatoes nor does it bake for hours. Heat the butter and saute the leeks and garlic until softened. Add the mushrooms and rosemary and fry until browned and fragrant. Remove from the heat and coat the vegetables with the flour. Place back onto moderate heat and slowly add the milk until well combined, cook until thickened. Season well. Slice the potatoes and place a layer into a baking dish, season well and pour half of the sauce onto the potatoes, cover with another layer of seasoned potatoes followed by the remaining sauce. Bake for +- 25 minutes. Eat as a meal or serve as a warm accompaniment with your braai or roast dinner. You need carbs and protein for energy. These will provide you those in the most delicious way. It would also make an excellent breakfast. Carefully open foil. Sprinkle the bacon and cheeses over potato mixture. Grill 3-5 minutes longer or until cheese is melted. Open foil carefully to allow steam to escape. The name is said to come from the action and sound that is made when the mash-and-cabbage cake is frying. I'm sure it could also be due to the fact that cabbage squeaks when you eat it! The smell of frying bubble and squeak is equally as evocative as the taste itself. Squeeze over lemon juice if you wish. In a medium saucepan, add potatoes and cover well with water. Remove potatoes and bring water to a boil. Add salt as desired and carefully add potatoes to boiling water. By bringing the water to a boil first, small new potatoes will cook even, otherwise, starting with cold water, the outside will become overdone before the middle is tender. Cook potatoes until fork tender testing after 15 minutes or so depending on how small the potatoes. Drain water and return potatoes back to the burner on low heat to dry potatoes for a couple of minutes. Remove potatoes and add the butter. Slice potatoes while hot. When butter has settled, toss in the potatoes, lemon juice, parsley, salt and pepper to taste. Stir to coat, cover and keep warm. Fold up the edges about 1/2 inch along all four sides. You should have a shallow rectangular “dish” made of foil. Spray the inside of the foil dish with cooking spray. Place the frozen fries in the dish. Spread the chile and cheese over the fries. Enclose the foil dish in another large piece of foil. Wrap the foil around the dish and close from the top. Place the entire foil packet over a campfire for 10-15 minutes. Check occasionally to test for doneness. Fries are done when they are cooked through and the cheese has melted. Primitive baking often uses mud as a heat buffer and defuses the heat more evenly. My article “Mud Spuds” describes the simplicity of this method. But for folks who aren’t inclined to use mud, you can use a modern alternative: a tin can. The goal of baking is to achieve even heat to cook your food more thoroughly and preferably without charring. If you are out camping and have brought some provisions, you can save the tin cans from your beans or soup for this purpose and keep the lids as well. I decided to give this “can baking” a try and tested two methods: a single can using it’s lid as a cover, and a double can arrangement with a larger can inverted over a smaller can. I favor cans with pull-tab tops that require no tools to open and also provides a “handle” for managing the lids. This works well with the single can method. However, in my double can set-up I used a P38 can opener to remove the lids on both cans which allowed the second slightly larger pull-tab can to be used as a cover over a conventional can. I put two medium sized potatoes in each can set-up. The best results for baking will come from the radiant heat of coals. I built a campfire and let it burn down to establish coals, then cleared a spot in the middle and placed the cans in the center. I fed small kindling around the edges to keep the coals alive and minimize the smoke. Slower cooking temps with a longer cooking time will penetrate the food deeper for more even cooking. I also turned the cans occasionally to help promote even heat. As usual, cooking times will vary based on heat source, can set-ups and the mass of the objects being baked. In the end, the double can potatoes took 35 minutes to bake to perfection while the single can took an additional 5 minutes due to the less efficient heat containment. So next time you have tin cans and a campfire, experiment with them for baking different foods and become familiar with this baking method. Smeer jou bakplaat met bietjie olie. Gooi nou jou oondchippes op en versprei eweredig. Spray nou met bietjie spray 'n cook of olie wat jy in spray bottel gegooi het. Stuk pan so nou en dan sodat dit chippies nie net eenkant verbruin nie, maar dat alkante lekker bak. Dis so maklik soos dit. Jy kan swaargewig foelie ook gebruik om die chips op rooster gaar te maak, maar ek verkies die bakplaat, dis stewiger en werk net beter. •Increase your vegetable and fibre intake by serving this dish with a green and an orange vegetable. 2.Wrap the potatoes in foil and bake for 30 - 40 minutes until soft. 3.Meanwhile, chop the chicken livers roughly, season with Robertsons Spice for Mince and Robertsons Peri Peri and fry in hot oil until just cooked. 4.Remove the livers from the pan and fry the onion and green pepper in the same pan. 5.Add the tomato, tomato sauce and Worcestershire sauce. Simmer until tomato is soft. 6.Add the chicken livers, heat through and check seasoning. 7.Remove the potatoes from the oven, open the foil and cut a cross in each – don’t cut right through. 8.Press open and spoon the chicken liver filling into the potato. Aartappels kan in foelie oor die kole gaargemaak word of in jou mikrogolf in 'n plastiese inkopiessak op HOOG vir so tussen 12 - 15 minute vir die 6 aartappels, toets maar vir gaarheid indien nie heeltemal gaar, plaas terug vir nog 'n paar minute. Passop net vir die stoom wanneer jy die sakkie oopmaak, dit kan jou lelik seer brand. Heerlik as ‘n ligte ete of selfs vir ontbyt met ‘n gebakte op geposeerde eier daarby. Heat the olive oil in a large pan and fry the onion, garlic, diced carrot and celery stick for 6-8 minutes. Stir in the minced lamb and cook for 3-4 minutes until browned, then add the sun-dried tomato paste and Worcestershire sauce. Stir in the beef stock and cover and simmer for 35-40 minutes until very tender. Season well. Mix the cornflour with cold water to a paste, stir in and cook for 1 minute. Serve over baked potatoes and top with grated cheddar. 1.Boil the potato cubes in salted water until soft and drain. 2.Add the mustard and butter to the hot potato cubes and stir to mix. Crush with a fork. 3.Season with salt and pepper and serve hot. 8 tot 12 Medium grootte aartappels geskil en halfeer. Die aartappels sal vir ten minste nog 'n uur lank "crispy" bly. Moenie bang wees dat die storie sal vlamvat nie. Slegs wanneer jy koue water by warm olie gooi sal dit brandslaan. Since this Mashed Potato Candy recipe is an unique and unusual recipe, I thought everyone would enjoy seeing it and perhaps making them. This is also a great recipe to use up extra mashed potatoes. Know one will guess that you have used mashed potatoes in this recipe, unless you tell them! Recipe is from the Portland Oregonian FOODday. This recipe is by Jane Claire Edmunds and Myrtle Hartley, two Oregon sisters. This is an old family recipe that has been passed down for generations. While the potato is cooking, grind the dates, figs, and raisins in a food mill or chop finely in a food processor. While the potato are still warm, scoop out the contents and mash well. Mix in vanilla, maple or almond extract, and powdered sugar until you have a stiff, workable dough. Add the fruit mixture and mix well. Refrigerate for an hour or so. Then shape into rolls 1 inch to 1 1/2 inches in diameter. Roll in 1/2 cup powdered sugar and ground nuts. roll up in plastic wrap and refrigerate. Let set a day or two, then slice into desired-size pieces. Store in refrigerator; bring to room temperature to serve. Keep candy pieces covered as they will dry out quickly. Variation Ideas: Instead of long rolls, the candy may be shaped into bonbon pieces or used to stuff dried fruits. This Mashed Potato Fudge recipe is an old family recipe that has been passed down for generations. Since this candy recipe is a unique and unusual recipes, I thought everyone would enjoy seeing them and perhaps making this delicious fudge. They taste kind of like Almond Joy (Mounds Bar) candy bars, but without the almonds. Makes a great Christmas candy. Also a great way to use leftover mashed potatoes. * You can also bake a medium-size potato and mash it while still hot. The mashed potatoes should equal 1/4 cup. Learn how to make Perfect Mashed Potatoes. You can also use instant mashed potatoes to make this candy. While the mashed potatoes are still hot, beat in the powdered sugar and coconut; then add the vanilla extract. Press into a lightly greased 8-inch square pan; set aside. Roll potato mixture on wax paper sprinkled with powdered sugar until very thin. Spread with creamy peanut butter and then roll into a long log. Roll in a little more powdered sugar and refrigerate. Slice to serve. Omit vanilla extract and substitute a few drops of oil of peppermint. Tint fondant pink with food coloring. Flatten balls to approximately 1/2-inch thickness. Add 2 teaspoons instant coffee powder to recipe while kneading mixture. Shape into finger rolls 1/2-by-2 inches. Roll in chocolate sprinkles. Quick and easy vegetarian dinner, great for your heart. 1. Wash potatoes well, pierce with a sharp knife and place directly onto the center rack in preheated oven at 180˚C. 2. Bake for 45 minutes to one hour until tender. 3. Alternatively cook in a microwave oven for 6-9 minutes. 4. Allow to cool enough to handle. 5. Slice the tops of the potatoes off and using a spoon, scoop out the flesh of the potatoes and place into a bowl. 6. Heat the milk, mild madras and the parsley together and once hot pour over the potato flesh. 7. Use a potato masher or a fork to smash the potato into a coarse mash. 8. Spoon the potato mash back into the potato jackets. 9. Gently heat the Rhodes Baked Beans in Tomato Sauce in small saucepan over medium heat or in the microwave for 3 minutes. 10. Top the baked potatoes with the warm beans and finish with some grated cheese. 11. Serve immediately with a fresh garden salad. Mix well..put into mould..press with the back of a spoon,refrigerate for ± 2 hours...throw out on plate..warm in micro or oven.. Prepare gravy by using 1 packet Royco/knorr brown onion gravy,add to it 1 cup boiling water,,mix well,pour over mash and serve.. The Traditional South African braai is not just a way to fill your stomach on a lazy Sunday afternoon. It is so much more. The braai is a South African past-time that has been past down from generation to generation. Over the years families have cultivated their own recipes and these recipes have become braai time favourites. This month we are bringing our favourite braai recipes and accompaniments to the great meat normally found at braais. Potato bake is a firm favourite at all braais and is a tasty side dish to meat as well as a great alternative for vegetarian guests. 500 ml cream and 250 ml Parmesan or pecorino shavings. Heat the olive oil in a frying pan and sauté the onions over a medium heat until soft and glossy. Add the balsamic vinegar and brown sugar and stir-fry for 5 minutes or until the onions begin to caramelise. Arrange a layer of potato slices in a greased, ovenproof dish (approximately 32 x 21cm), season with salt and black pepper and arrange a layer of caramelised onions on top. Repeat the layers with the remaining potatoes and onions and end with a layer of potato slices. Pour the cream over, sprinkle the Parmesan or pecorino shavings on top and bake for 30-45 minutes or until golden brown and cooked. I wanted to grill something new and had little red & white potatoes reproducing in a bowl, so I cut them up into thinish slices, coated them with olive oil. I mixed in a good dose of sweet paprika and some salt. Then I put them on bamboo skewers and grilled the them for a while. Yummy alone or with ketchup. Cover and cook for 15 minutes on low, turning frequently. Garnish with chopped dhania (coriander). For the harissa paste, blitz with each other all components, except olive oil. Add the oil in a steady stream right up until effectively mixed and ingredients become paste-like. Heat the parboiled potatoes in a pan to steam dry and get rid of excess water. In another pan or on your braai, fry the bacon right up until virtually crisp, add paprika and permit to cook for a minute. Include your harissa paste and potatoes to the bacon and season to taste. Get rid of from heat, add the fresh parsley, drizzle with olive oil and pack in a foil parcel. Location the parcel on the coals to cook for about twenty minutes.